One of the most exhausting parts of parenting toddlers and young children (other than being up half the night with them) is the constant requests. Requests for snacks. In particular bowls. With a drink in that one special cup. Requests for videos on YouTube. Not that video. The one they watched last Thursday. Requests to go the park. And the swimming pool. And to soft play. Requests for you to read their favourite book with them. Again. And again. Some days it feels like it doesn’t stop. And while a lot of the time we can happily say ‘yes’ and give them what they’re asking for, sometimes the answer has to be ‘no. The thing is, children don’t really like hearing the word ‘no’. It makes them feel upset. Or angry. Or both. Which is valid to be fair. No one really likes to be told ‘no’. And if your toddler really wanted a snack in that special red bowl and you said no then they’re bound to be a bit frustrated by that. There is something you can try though, to say ‘no’ in a way that has a much higher chance of a happy ending for everyone. The trick is to say ‘no’ without actually saying the word ‘no’. You can even do it by saying ‘yes’ instead. What I mean is, if you child asks you for that snack but it’s 5 minutes from dinner time. Instead of saying, ‘no, dinner’s nearly ready’ you can say ‘yes, but you need to eat your dinner first’. Or if they are at your feet asking you to read that book to them while you sort the washing out. You can tell them that yes, you will read the book to them but you need to finish sorting the washing first. Instead of just giving them a flat ‘no’ or a vague ‘we’ll do it later’. Even little children will understand if you give them a clear answer of what needs to be done first or instead of the thing they are asking to do. Of course there’ll be times when they still get upset and angry that you won’t give them what they want straight away. But wording your responses like this really will keep the odds in your favour that they’ll accept it with less frustration. Just cutting the word ‘no’ from your response can be enough to stop children from pushing and arguing back. 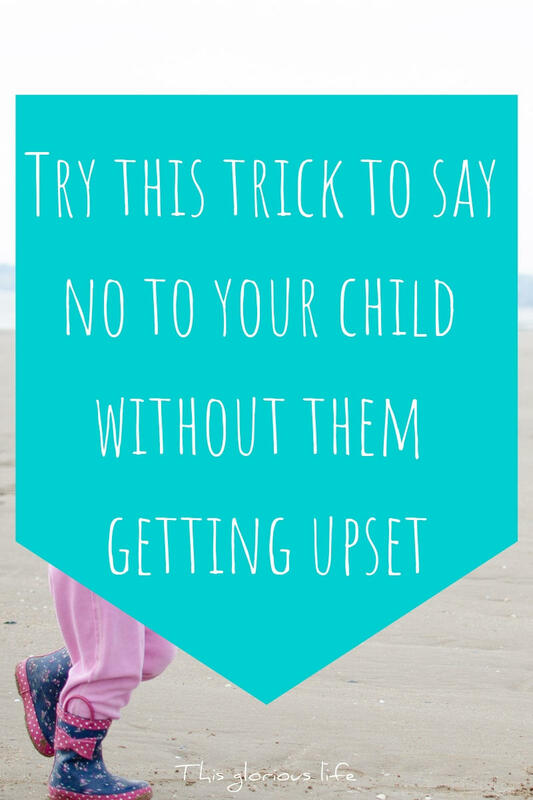 Do you find it hard to say no to your children? Do you find they get really upset and frustrated when you do say no? Give this trick a try and see if it helps you and your family! Since January 2017 I’ve been taking a family photo every month as part of the Me and Mine project. I actually attempted the project in 2016 I think but didn’t last long at all with it. It seems like such a simple thing to do, but honestly I have really struggled with it at times over the last few years. But it is so worth the effort each month to take these photos and I absolutely love having them to look back on. 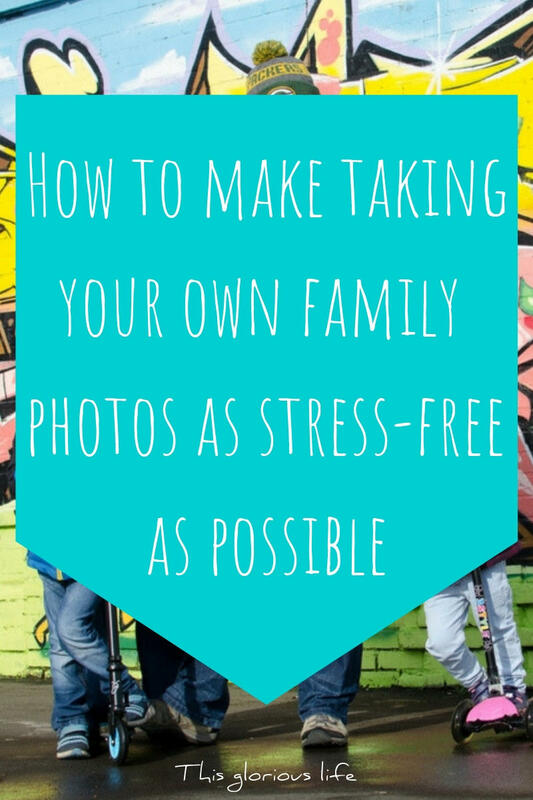 If you don’t ever really take any photos of you with your family because it seems too hard, or you think it’ll be too stressful then this post is for you. Here are my top tips for taking your own family photos and making the process as stress-free as possible. I mean, really lower your expectations. If this is the first time you’re trying to take your own family photos then try not to expect too much from this first attempt. Let go of the idea you have in your head of the perfect family photo. This way you can hopefully not put pressure on yourself and your family to capture this ‘perfect’ shot. Try instead to focus on getting a photo that is perfectly you. Keep in mind that the weird grimace-like smile that your 4 year old does for the camera might be a bit frustrating right now when all you want is a ‘nice’ photo. But in a few years time you’ll look back at it and love how much that fake smile captures who he was at this time in his life. 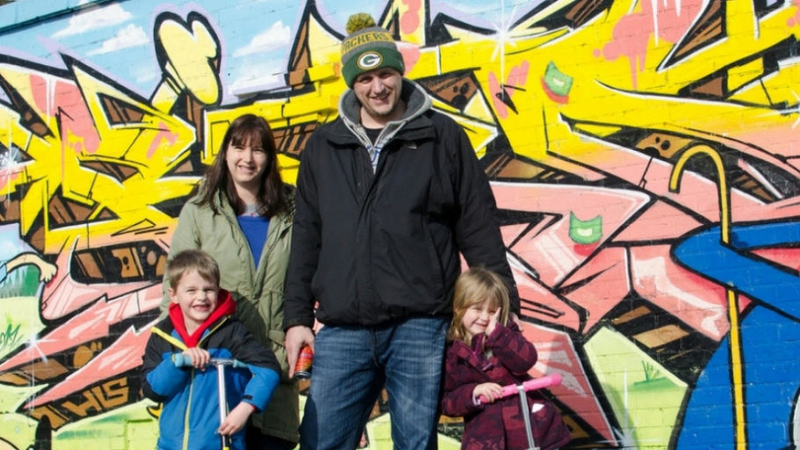 If at all possible use a tripod and a remote trigger to take your family photos. 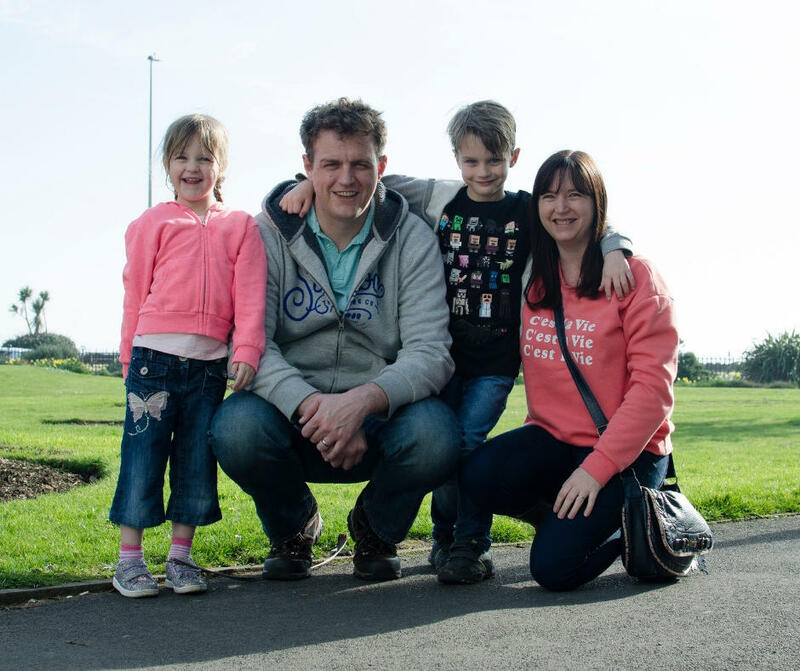 Set your camera up on the tripod and then get your family where you want them in the frame. Then jump in with them and snap away with the remote trigger. If you don’t have a remote then use the timer function on your camera. This can be actually be a great way to get more natural smiles from your children as they laugh at you frantically running to get in the shot each time! If you don’t have a tripod then get creative looking for places to prop your camera up. We’ve used walls and benches at the park quite a lot when I’ve not wanted to take the tripod out and about with us. Sometimes it can work to take family photos on the spur of the moment, but for the most part it’s worth making a bit of a plan in advance. Think about where and when you want to take the photos. Try and plan them for a time when everyone will have been fed recently and no one is due a nap! 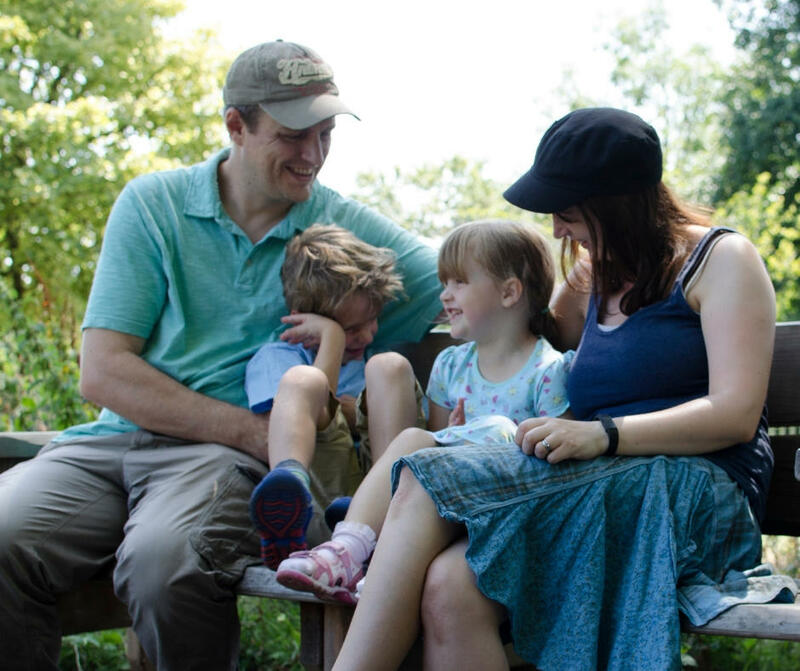 Have a quick chat with your children before you start and explain to them that you’d like to take a few quick photos of the family together and that you would really like them to just cooperate. Use chocolate bribes if necessary. If everyone knows what you want them to do before you start you’ll have a better chance of getting some good photos. When you start taking the photos do the more posed, everyone-looking-at-the-camera type shots first. Children will lose interest and get restless quite quickly so get these pictures done first and then you can move on to more relaxed photos. Once you’ve got the more posed photos that you want you can try a few other options. You can encourage everyone to hug each other, to look at one another, to tell each other jokes. Tickling little ones is a great way to get fun, happy family photos. You don’t have to stay still either, you can set up the camera and then get photos of you all walking towards it. These kinds of photos where you interact with each other, instead of the camera, are quite often my favourites. And they’re generally easier and less stressful to take than when you’re worrying about having everyone look at the camera. If you want to then go for coordinating pieces rather than matching outfits, but really the best, less-stress option is to just let everyone wear what they’re comfortable in. You’ll get much better pictures when everyone feels like themselves. 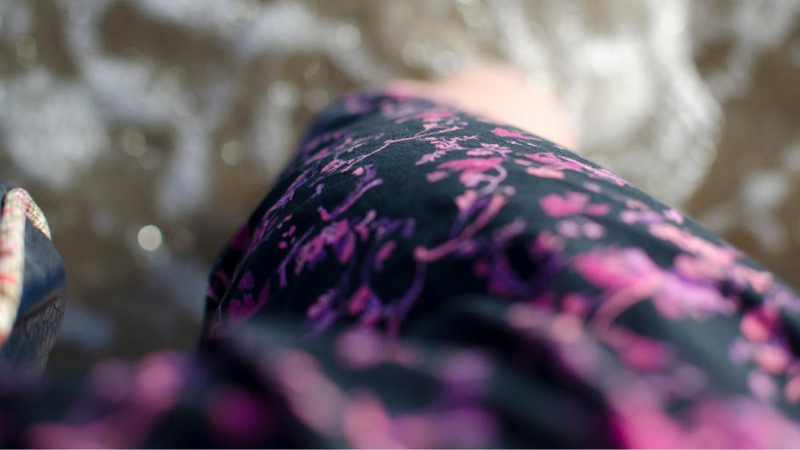 The beauty of digital photography is that you can take way more photos than you actually need. So use this to your advantage when you try to take your own family photos and just keep taking picture after picture. Take more photos than you think you’ll need, to have a better chance of everyone being in focus, with their eyes open and looking where you want them to be looking. Following on from the last point, make sure you stop regularly to check the photos you’ve taken. You don’t want to take hundreds of photos to only realise at the end, when everyone has had enough, that none of them are actually in focus. So stop now and then to check the photos. Make sure the settings are ok and that the pictures aren’t too dark or blown out, and check that you’re all in focus. Remember that this is meant to be fun, so if things just aren’t working out stop, and try again another day. Some days you’ll find that someone in the family just isn’t in the mood to have their photo taken, or you just won’t feel happy with the pictures you’re getting. On these days it really is just best to stop, take a break, try again later. When was the last time you had a photo of you and your family all together? 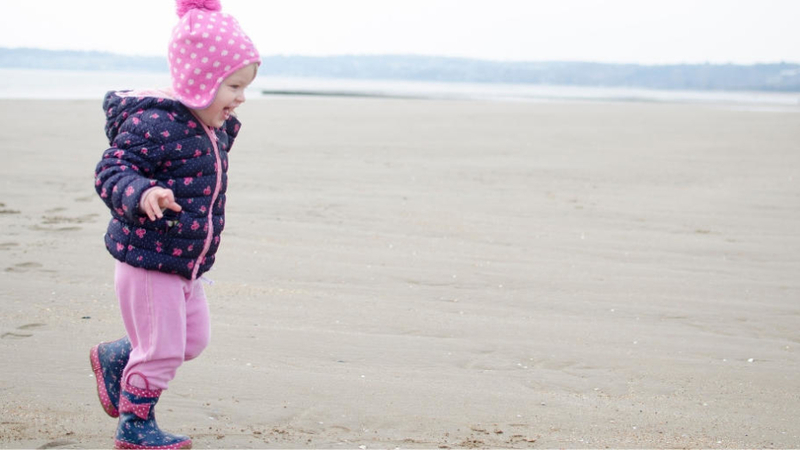 Hopefully these tips will help give you the confidence to head out with your family and take some if you’ve not done it for a while. Have you ever got to the office and realised that you left your door card or work ID at home? Or remembered as you arrive at school with the children that you were meant to return a form for something, that is now sitting on the dining room table. We’re all so busy, with so many thoughts running through our heads and so many important things to keep track of, that it can be so hard to remember everything. So next time you need to make sure you don’t forget anything important when you head out of the house in the morning, try this one little trick to help you remember everything. Write out a list of the things you need to take with you and stick it to the back of your front door. This way as you head out the door you can scan it quickly and make sure you have everything you need. 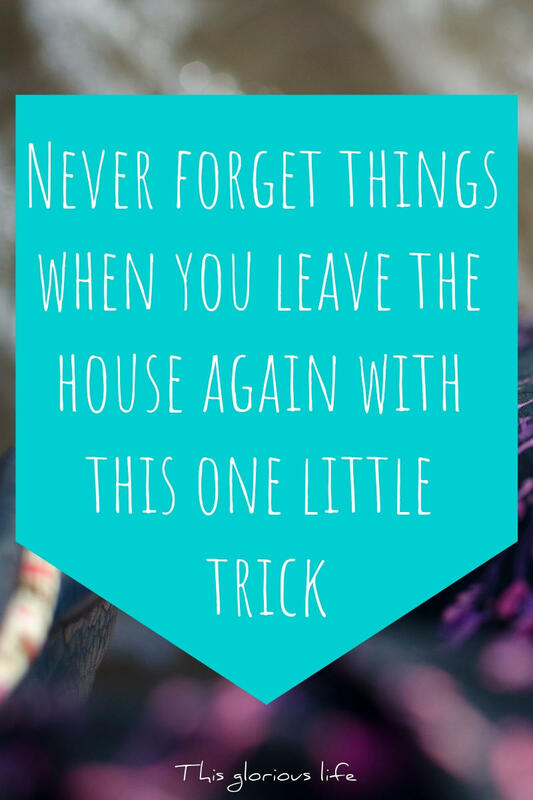 There are actually a few ways this can work for you, depending on how forgetful you normally are. If you’re really quite forgetful and often find once you’re out that you’ve left something at home, then you can write out a list of all the things you generally need to have in your bag and then stick that to the back of the door. This list might be quite short. If you’re going to work for example, you might just need to remember your wallet, phone, keys, ID, door card and lunch. It might be a bit longer if you’re a parent and you’re heading out somewhere with your baby. In this case your list might include your wallet, phone and keys. 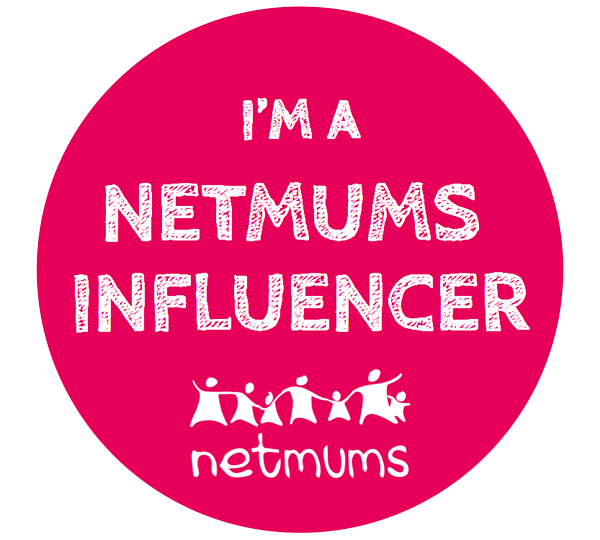 Then it would also have things like nappies, wipes, change of clothes, muslins, bottles, dummy etc. Whatever you normally need to take out and about with you, put it on the list and then stick it somewhere you can quickly scan it before you leave to make sure you have everything. If you’re generally pretty good at remembering the regular bits and pieces, but have days where there are extra things you don’t want to forget, then keep a pile of post-its and a pen near the front door. Then the night before you can note down what you need to remember in the morning and stick the post-it to the back of the door. This could be things like a permission slip that needs to be taken to school. Or the book that you promised to lend to a friend. Or your gym kit if you’re planning on working out during your lunch break at work. If you’re not a fan of post-its then you could get a little whiteboard or notice board that you can put up in the hallway or by the front door for jotting down reminders. Or you could even get a magna doodle like the guys had in friends to scribble down one-off things you need to remember. Whichever way you choose to do it, the principle is the same. Make a written note of the things you absolutely need to remember to take out with you, and put it somewhere you’re guaranteed to see it before you head out the front door. A very simple trick I know, but sometimes the simple, obvious ones are the most effective! People, in general, are creatures of habit. Our brains like to use shortcuts to work as efficiently as possible, and this often means we do the same activities in the same way over and over again. Because they’re easy and familiar and comfortable. These habits make our lives easier and let our brains focus on other things. The thing is, it can be so hard to get a habit established in the first place. 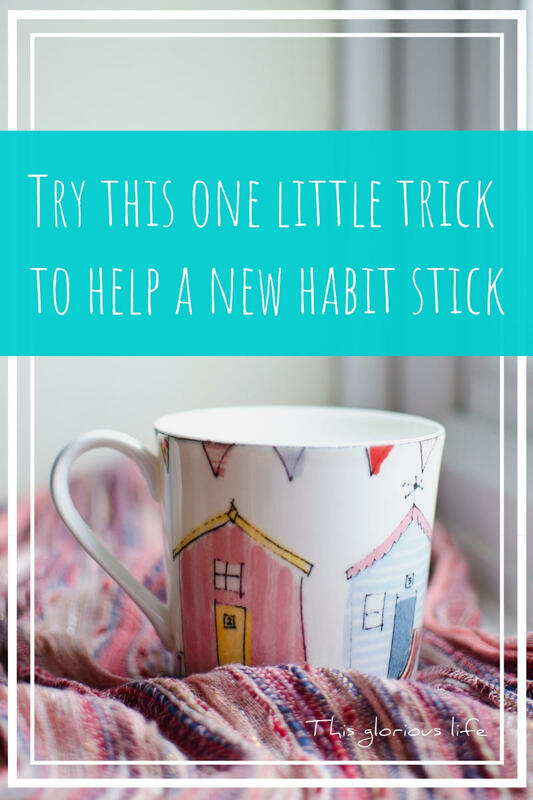 If there’s a new habit you’d like to start then try this little trick to help it stick. Commit to the new habit for 30 days. It will take some effort but if you can push yourself to do your new thing every day for about 30 days that should be enough for it to stick and start becoming easier and more automatic. That first month of conscious effort is all about retraining your brain, forming new neural pathways and conditioning yourself to the new habit. The trick here is the same as the one I wrote about for getting started with a new exercise routine. You need to make it as easy as possible for yourself to do the new thing every single day for that first month. So say, for example, you want to start taking multivitamins. If you’re not in the habit of taking them it can be really easy to forget to do it. But if you put the bottle next to the kettle you’ll see it each morning when you go to make a cuppa and be reminded to take one. Or if you want to drink more water then, again, make it as easy as possible on yourself. Set a reminder on your phone to go off at regular intervals throughout the day, prompting you to drink a glass of water. Get one of these water bottles that helps you track how much you’ve drunk so far that day. If you have a bullet journal then use that to keep a record of how much you’re drinking. Put a glass or a bottle next to the kettle so if you go to make a coffee you’ll be prompted to have a glass of water first/instead. It might be a different type of habit that you want to create. 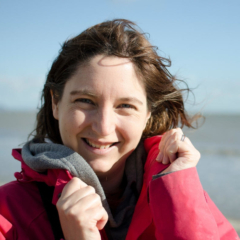 It could be that you want to start painting after years of hiding your creative side. Again, make a point of drawing or painting something, no matter how small, every day for a month. You can quite often find challenges on Instagram that will help push you with this one. And doing it every day will remind you how much you love it, how great it feels to be in the flow of creating. Chances are once you’ve made it through that tricky first month of establishing a new habit it should start to become easier, and almost second nature. If it’s a habit you’ve started for the right reasons then you’ll probably find you miss it if you do stop for some reason after a month of doing it every day. What new habit would you like to introduce to your life? Have you tried committing to it every day for at least a month to give it time to stick and really become part of your routine? First things first, before anyone starts feeling defensive, I’m not actually suggesting that your marriage is ‘a show’ by any definition of the word. 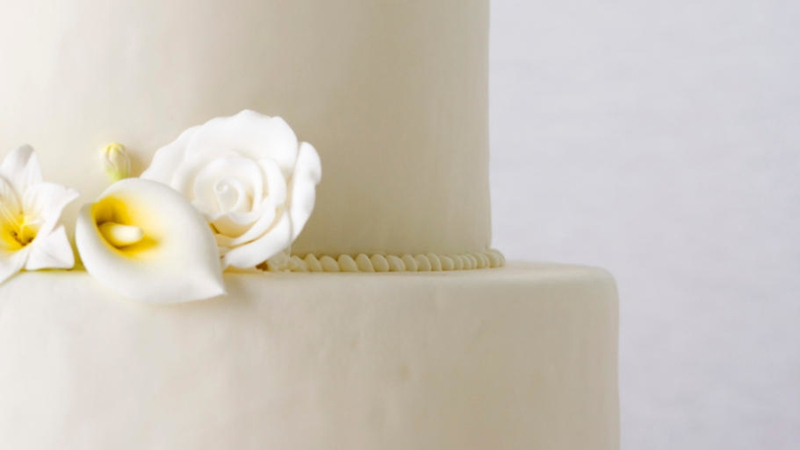 But in the planning of a wedding, it can be easy to fall into this kind of worrisome feeling. You might realise after a long planning process that actually, most of the decisions you’ve made have been to compromise for something. Perhaps you want it to be so all of your family can attend, or you are opting for something too traditional despite your tastes because you simply want to please your parents. This is what I mean by a ‘show’; you might be making all the ‘right’ choices, but none of those you and your partner actually want. But for what other purpose are you supposed to plan a wedding? This is quite a vastly ceremonial day after all, right? Well, it doesn’t have to be that simple. With this guide, you might be able to craft an event, but also ensure that it’s a celebration of hearts, not simply something chosen out of compulsion. A wedding can be an all-day event, with hundreds of family members in attendance, a long convoy of cars from place to place, a fantastic church or cathedral as the main space, enough food to feed a small army and perhaps the booking of a range of entertainers. But there’s no need to go this massive for your wedding to be worthwhile. What do you actually want? 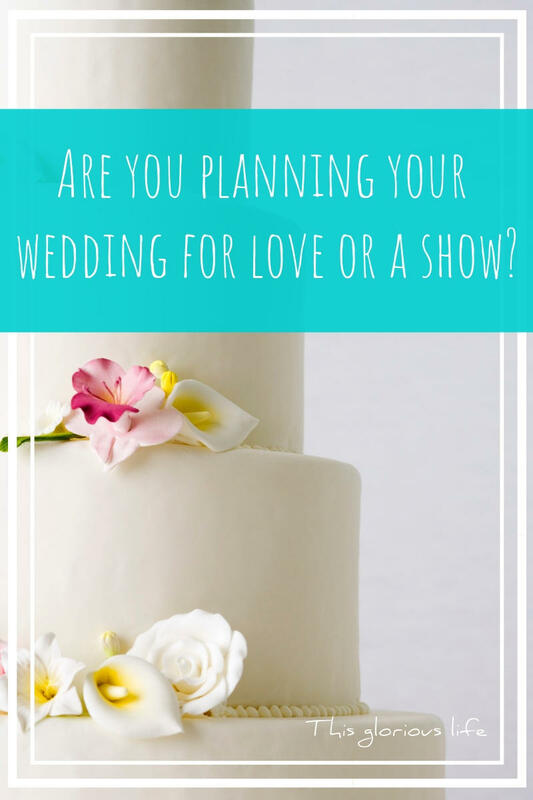 Have you asked that of yourself and your partner, or are you simply opting for those suggested to your by your wedding planners? Might it be that keeping the wedding a little more tight, a little more humble and a little more engaging could help you enjoy it more? There’s only so much you can do and only so many people you can meet at your wedding, and sometimes keeping it comfortable can help you feel more like yourself. For example, while the Royal wedding that took place last year was wonderful to watch and beautiful from every angle, it likely felt as more of a show and less of a personable, comfortable event for both bride and groom. Of course, if you enjoy spectacle and size that’s absolutely fine. But be sure it’s something you want, and do not fall into it out of obligation. It can be hard to come to hard and fast decisions that both you and your partner agree on. From excellent bands you might pick to the catering you might choose, it can be hard to define decisions. This is where exercising your ability to make compromises and to level the playing field can help you both come to an arrangement you are happy with, as not all couples share the same tastes. This means you needn’t simply ‘accept’ a decision out of your control. This will give you the tools to enjoy a wedding much more. Don’t feel as if you have to rush from one place to the next during your wedding. Speak to people, smell the flower arrangements, savour your food and dance with your partner. Give yourself time to enjoy all of these things. If you want to walk the grounds, you can. Give yourself to the experience. With these simple titbits of advice, your wedding is sure to be one of the best days of your life. When it comes to owning a car, we all dream of buying one new one, however, we all know that they can be expensive. 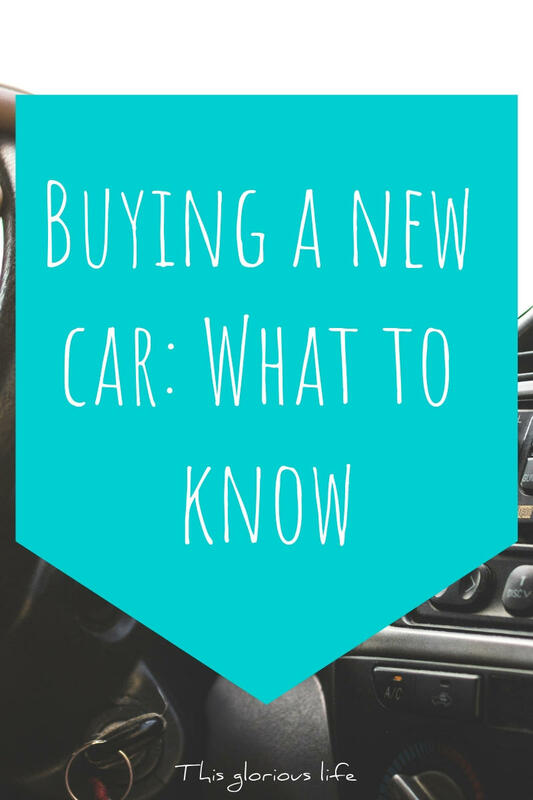 With new DVLA number plates coming out soon, and plenty of places to buy a new car such as Peter Vardy Holdings, there are a few things you should consider if you’re thinking of buying new, which I’ve highlighted below. As we all know, cars are the type of item that begin to lose value straight away. This is particularly true when you buy a new car, as it’ll depreciate in value as soon as you leave the dealership. Because of this, think about what car to buy based on how well it holds its value. This means that when you finally decide to sell, you will have lost as little money as possible. Cars by Mini, Audi, Volkswagen, Lexus, Ford and Vauxhall are all very good cars when it comes to holding value. Knowing the best time to strike is key to ensuring you get the best car for your money. This will all depend on the type of car that you want. 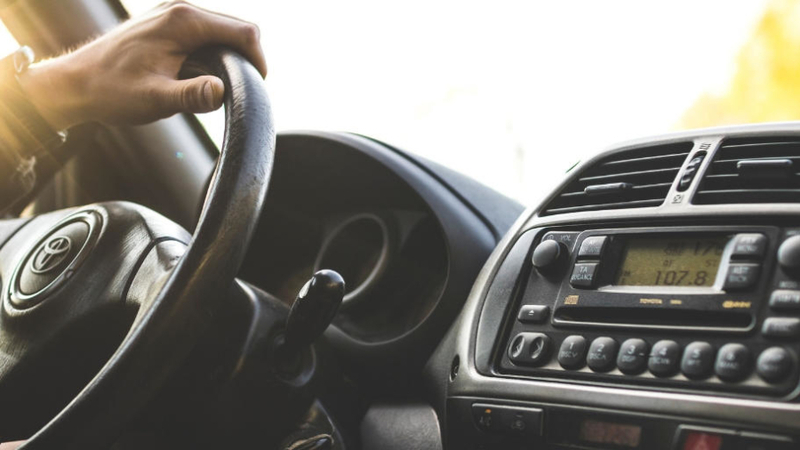 Therefore, once you’ve done your research and decided on the vehicle that’s best for you, have a look to find the best time to buy that specific model. Things that can impact this are payday weekends and the style of the car, as convertibles will be more expensive in summer, meaning winter is the best to buy. Also, think of buying in the months that see quarterly sales, such as March, June, September and December. Make sure you cover all your needs when it comes to the vehicle and don’t compromise. By this we mean don’t opt for the car that looks better and costs more, but doesn’t offer you the space or mod cons you require. By doing this you’ll end up realising you’ve made the wrong choice a few months down the line, ending in you needing to get a new car that caters to your needs. So, you may have the money to buy a new car, but don’t let that go to your head. Once you’ve purchased the car you’ll need to run it. Because of this, make sure you do your research beforehand, finding out how much petrol or diesel the car will use and how much it costs, and how much it’ll cost to have insured. You should also check to see how reliable they are, because you don’t want to end up paying to have it fixed regularly, which could cost a small fortune. When it comes to interior design, it can be hard to achieve that completed and tidy look without the use of a professional interior designer. This is because an interior designer is aware of all the tips and tricks it takes to make a room complete. 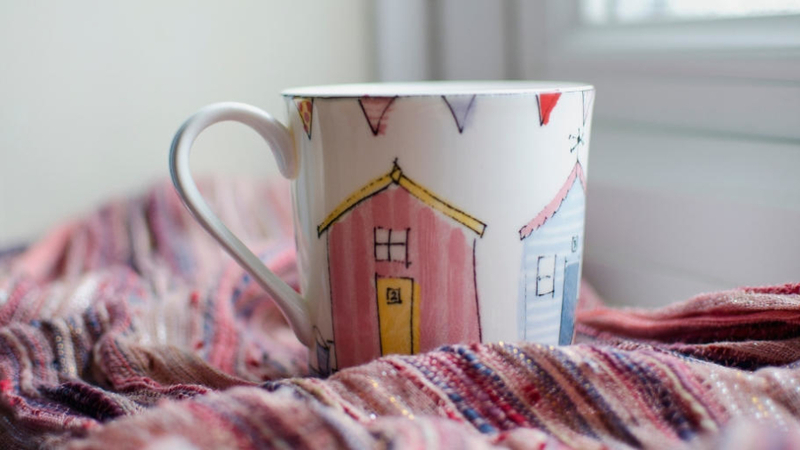 One of the best tips is to upgrade the finer details as this can make a huge difference to how a room looks but it is often overlooked with people focusing on the colour, rugs, artwork etc. Moulding can look fantastic in older homes and a great way to add visual appeal and elegance to the ceiling (an area often overlooked in interior design). There are all kinds of style and types to choose from so you should be able to find one which suits your style and looks impressive. The door is another often overlooked feature of a room but the first thing that you look at before entering and the last thing that you see before leaving. There are a few ways to make your door more attractive but upgrading the door handle to something stylish and classy is the most effective. Similarly, changing the cabinet handles can make a big difference in the kitchen and anywhere else with cabinets. Most people do not think about electrical sockets and switches when decorating a room yet these can take up a fair amount of space and your eyes are often led there through cables and wires. 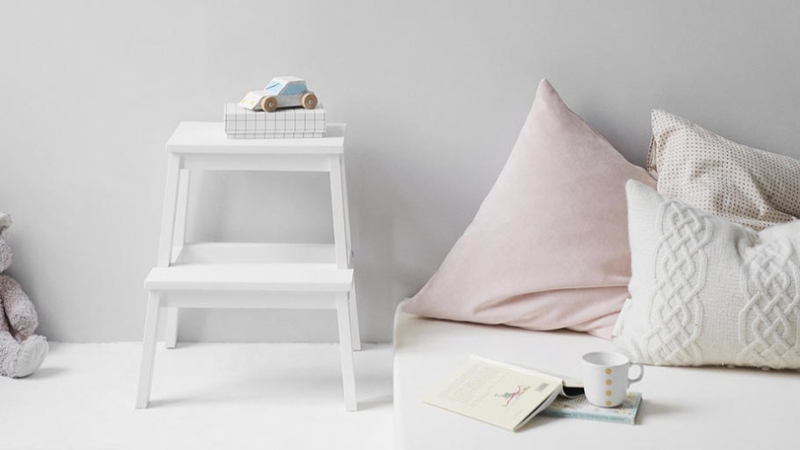 Upgrading by choosing more attractive materials, patterns and colours can make a big difference and make the room look more modern. Places like Schneider Electric have a wide range to choose from which can upgrade any room. The curtains/blinds are an area that takes up a huge amount of wall space but are often ignored. Choose large drapes from a nice material for the winter months and then replace these with something lighter in the summer to add style and practicality. Lighting sets the mood and atmosphere so it is incredibly powerful in interior design yet many homeowners leave the lighting as it was when they moved in. Experiment with a range of light sources and try different lamp shades to create the desired atmosphere in the room that you are decorating. 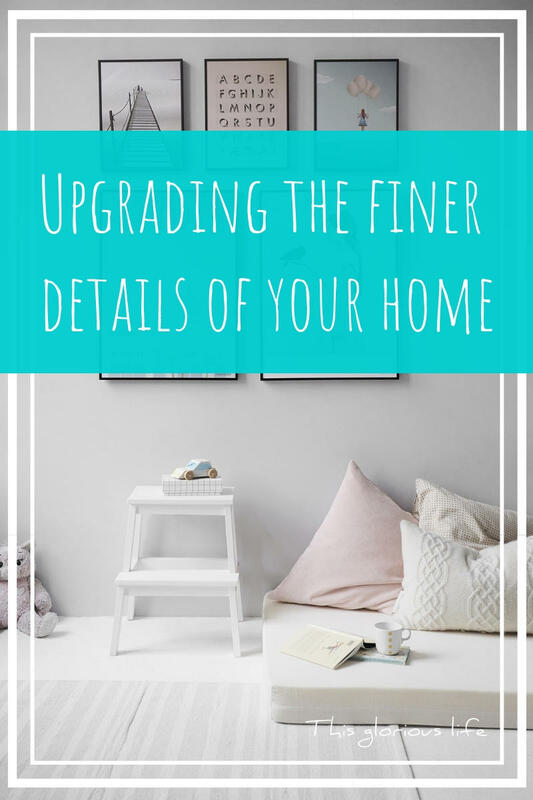 It is the finer details that really complete a room to give it that professional look and these are just a few ways that you can achieve this while decorating.